Hands at the Cuevas de las Manos upon Río Pinturas, near the town of Perito Moreno in Santa Cruz Province, Argentina. Hand stencils, made by blowing pigment over a hand held against a wall, have been found in Asia and Europe dating from over 35,000 years ago, and later prehistoric dates in other continents. After that stencilling has been used as a historic painting technique on all kinds of materials. Stencils may have been used to colour cloth for a very long time; the technique probably reached its peak of sophistication in Katazome and other techniques used on silks for clothes during the Edo period in Japan. In Europe, from about 1450 they were commonly used to colour old master prints printed in black and white, usually woodcuts. This was especially the case with playing-cards, which continued to be coloured by stencil long after most other subjects for prints were left in black and white. Stencils were used for mass publications, as the type did not have to be hand-written. In China seals were used since at least the Shang dynasty. In the Western Zhou, sets of seal stamps were encased in blocks of type and used on clay moulds for casting bronzes. By the end of the 3rd century BC seals were also used for printing on pottery. In the Northern dynasties textual sources contain references to wooden seals with up to 120 characters. The seals had a religious element to them. Daoists used seals as healing devices by impressing therapeutic characters onto the flesh of sick people. They were also used to stamp food, creating a talismanic character to ward off disease. The first evidence of these practices appeared under a Buddhist context in the mid 5th century. Centuries later seals were used to create hundreds of Buddha images. Stone and bronze blocks have been used to print fabric. Archaeological evidence of them have been unearthed at Mawangdui and in the tomb of the King of Nanyue, while block printed fabrics have been discovered at Mashan zhuanchang in Jiangling, Hubei. In the 4th century the practice of creating paper rubbings of stone carvings such as calligraphic models and texts took hold. Among the earliest evidence of this is a stone inscription cut in mirror image from the early 6th century. Korean wood printing block from the 19th century, on display at the British Museum in London. A printing block from Yangzhou. Song dynasty (960-1279) bronze plate advertising print for the Liu family needle shop at Jinan. Earliest extant print advertisement. Ceramic movable type print from the Western Xia. Found in Wuwei. Wooden movable type for Old Uyghur alphabet, dated to the 12th-13th centuries. Discovered in the Mogao caves. Woodblock printing (diaoban yinshua 雕版印刷), known as xylography today, was the first method of printing applied to a paper medium. It became widely used throughout East Asia both as a method for printing on textiles and later, under the influence of Buddhism, on paper. As a method of printing on cloth, the earliest surviving examples from China date to about 220. Ukiyo-e is the best known type of Japanese woodblock art print. Most European uses of the technique on paper are covered by the term woodcut (see below), except for the block-books produced mainly in the fifteenth century. According to southern Chinese histories, in the 480s, a man named Gong Xuanxuan styled himself Gong the Sage and 'said that a supernatural being had given him a "jade seal jade block writing," which did not require a brush: one blew on the paper and characters formed.' He then used his powers to mystify a local governor. Eventually he was dealt with by the governor's successor, who presumably executed Gong. Timothy Hugh Barrett postulates that Gong's magical jade block was actually a printing device, and Gong was one of the first, if not the first printer. The semi-mythical record of him therefore describes his usage of the printing process to deliberately bewilder onlookers and create an image of mysticism around himself. The rise of printing was greatly influenced by Mahayana Buddhism. According to Mahayana beliefs, religious texts hold intrinsic value for carrying the Buddha's word and act as talismanic objects containing sacred power capable of warding off evil spirits. By copying and preserving these texts, Buddhists could accrue personal merit. As a consequence the idea of printing and its advantages in replicating texts quickly became apparent to Buddhists, who by the 7th century, were using woodblocks to create apotropaic documents. These Buddhist texts were printed specifically as ritual items and were not widely circulated or meant for public consumption. Instead they were buried in consecrated ground. The earliest extant example of this type of printed matter is a fragment of a dhāraṇī (Buddhist spell) miniature scroll written in Sanskrit unearthed in a tomb in Xi'an. It is called the Great spell of unsullied pure light (Wugou jingguang da tuoluoni jing 無垢淨光大陀羅尼經) and was printed using woodblock during the Tang dynasty, c. 650-670. A similar piece, the Saddharma pundarika sutra, was also discovered and dated to 690 to 699. This coincides with the reign of Wu Zetian, under which the Longer Sukhāvatīvyūha Sūtra, which advocates the practice of printing apotropaic and merit making texts and images, was translated by Chinese monks. Evidence of woodblock printing appeared in Korea and Japan soon afterward. The Great Dharani Sutra (Korean: 무구정광대다라니경, translit. Muggujeonggwang Daedharanigyeong Hanja: 無垢淨光大陀羅尼經) was discovered at Bulguksa, South Korea in 1966 and dated between 704 and 751 in the era of Later Silla. The document is printed on a 8 cm × 630 cm (3.1 in × 248.0 in) mulberry paper scroll. A dhāraṇī sutra was printed in Japan around AD 770. 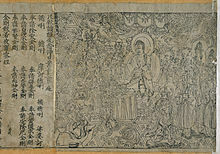 One million copies of the sutra, along with other prayers, were ordered to be produced by Empress Shōtoku. As each copy was then stored in a tiny wooden pagoda, the copies are together known as the Hyakumantō Darani (百万塔陀羅尼, "1,000,000 towers/pagodas Darani"). The oldest extant evidence of woodblock prints created for the purpose of reading are portions of the Lotus Sutra discovered at Turpan in 1906. They have been dated to the reign of Wu Zetian using character form recognition. The oldest text containing a specific date of printing was discovered in the Mogao Caves of Dunhuang in 1907 by Aurel Stein. This copy of the Diamond Sutra is 14 feet long and contains a colophon at the inner end, which reads: Reverently [caused to be] made for universal free distribution by Wang Jie on behalf of his two parents on the 13th of the 4th moon of the 9th year of Xiantong [i.e. 11 May, AD 868 ]. It is considered the world's oldest securely-dated woodblock scroll. The Diamond sutra was closely followed by the earliest extant printed almanac, the Qianfu sinian lishu (乾符四年曆書), dated to 877. From 932 to 955 the Twelve Classics and an assortment of other texts were printed. During the Song dynasty, the Directorate of education and other agencies used these block prints to disseminate their standardized versions of the Classics. Other disseminated works include the Histories, philosophical works, encyclopedias, collections, and books on medicine and the art of war. In 971 work began on the complete Tripiṭaka Buddhist Canon (Kaibao zangshu 開寶藏書) in Chengdu. It took 10 years to finish the 130,000 blocks needed to print the text. The finished product, the Sichuan edition of the Kaibao canon, also known as the Kaibao Tripitaka, was printed in 983. 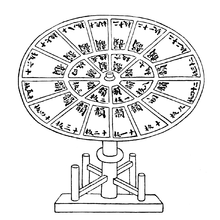 In 989 Seongjong of Goryeo sent the monk Yeoga to request from the Song a copy of the complete Buddhist canon. The request was granted in 991 when Seongjong's official Han Eongong visited the Song court. In 1011, Hyeonjong of Goryeo issued the carving of their own set of the Buddhist canon, which would come to be known as the Goryeo Daejanggyeong. The project was suspended in 1031 after Heyongjong's death, but work resumed again in 1046 after Munjong's accession to the throne. 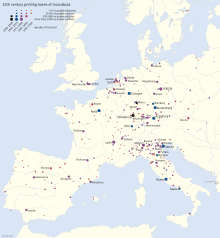 The completed work, amounting to some 6,000 volumes, was finished in 1087. Unfortunately the original set of woodblocks was destroyed in a conflagration during the Mongol invasion of 1232. King Gojong ordered another set to be created and work began in 1237, this time only taking 12 years to complete. In 1248 the complete Goryeo Daejanggyeong numbered 81,258 printing blocks, 52,330,152 characters, 1496 titles, and 6568 volumes. Due to the stringent editing process that went into the Goryeo Daejanggyeong and its surprisingly enduring nature, having survived completely intact over 760 years, it is considered the most accurate of Buddhist canons written in Classical Chinese as well as a standard edition for East Asian Buddhist scholarship. Prior to the introduction of printing, the size of private collections in China had already seen an increase since the invention of paper. Fan Ping (215-84) had in his collection 7,000 rolls (juan), or a few hundred titles. Two centuries later, Zhang Mian owned 10,000 juan, Shen Yue (441-513) 20,000 juan, and Xiao Tong and his cousin Xiao Mai both had collections of 30,000 juan. Emperor Yuan of Liang (508-555) was said to have had a collection of 80,000 juan. The combined total of all known private book collectors prior to the Song dynasty number around 200, with the Tang alone accounting for 60 of them. Following the maturation of woodblock printing, official, commercial, and private publishing businesses emerged while the size and number of collections grew exponentially. The Song dynasty alone accounts for some 700 known private collections, more than triple the number of all the preceding centuries combined. Private libraries of 10-20,000 juan became commonplace while six individuals owned collections of over 30,000 juan. The earliest extant private Song library catalogue lists 1,937 titles in 24,501 juan. Zhou Mi's collection numbered 42,000 juan, Chen Zhensun's collection lists 3,096 titles in 51,180 juan, and Ye Mengde (1077-1148) as well as one other individual owned libraries of 6,000 titles in 100,000 juan. The majority of which were secular in nature. 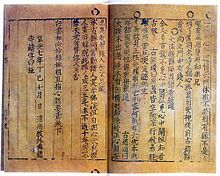 Texts contained material such as medicinal instruction or came in the form of a leishu (類書), a type of encyclopedic reference book used to help examination candidates. The emperor went to the Directorate of Education to inspect the Publications Office. He asked Xing Bing how many woodblocks were kept there. Bing replied, "At the start of our dynasty, there were fewer than four thousand. Today, there are more than one hundred thousand. The classics and histories, together with standard commentaries, are all fully represented. When I was young and devoted myself to learning, there were only one or two scholars in every hundred who possessed copies of all the classics and commentaries. There was no way to copy so many works. Today, printed editions of these works are abundant, and officials and commoners alike have them in their homes. Scholars are fortunate indeed to have been born in such an era as ours! I can recall meeting older scholars, long ago, who said that when they were young they had a hard time getting their hands on a copy of Shiji or Han shu. If they were lucky enough to get one, they thought nothing of copying the entire text out by hand, so they could recite it day and night. In recent years merchants engrave and print all manner of books belonging to the hundred schools, and produce ten thousand pages a day. With books so readily available, you would think that students' writing and scholarship would be many times better than what they were in earlier generations. Yet, to the contrary, young men and examination candidates leave their books tied shut and never look at them, preferring to amuse themselves with baseless chatter. Why is this? Woodblock printing also changed the shape and structure of books. Scrolls were gradually replaced by concertina binding (經摺裝) from the Tang period onward. The advantage was that it was now possible to flip to a reference without unfolding the entire document. The next development known as whirlwind binding (xuanfeng zhuang 旋風裝) was to secure the first and last leaves to a single large sheet, so that the book could be opened like an accordion. Around the year 1000, butterfly binding was developed. Woodblock prints allowed two mirror images to be easily replicated on a single sheet. Thus two pages were printed on a sheet, which was then folded inwards. The sheets were then pasted together at the fold to make a codex with alternate openings of printed and blank pairs of pages. In the 14th century the folding was reversed outwards to give continuous printed pages, each backed by a blank hidden page. Later the sewn bindings were preferred rather than pasted bindings. Only relatively small volumes (juan 卷) were bound up, and several of these would be enclosed in a cover called a tao, with wooden boards at front and back, and loops and pegs to close up the book when not in use. For example, one complete Tripitaka had over 6,400 juan in 595 tao. As a result of block-printing technology, it became easier and cheaper to produce multiple copies of books quickly. By the eleventh century, the price of books had fallen by about one tenth what they had been before and as a result they were more widely disseminated. Nevertheless, even in the fifteenth century most books in major libraries were still in manuscript, not in print. Almost to the end of the empire it remained cheaper to pay a copyist than to buy a printed book. Seven hundred and fifty years after the first imperially sponsored printed works in the Northern Song, the greatest book project of the eighteenth century, the Siku quanshu 四庫全書, was produced as a manuscript, not as a printed collection. About 4 percent of it was printed in movable type in 1773, but it was hand-carved movable wooden type. Indeed, the entire collection was only printed for the first time in the 1980s. Access to books, especially large works, such as the Histories, remained difficult right into the twentieth century. Not only did manuscripts remain competitive with imprints, they were even preferred by elite scholars and collectors. The age of printing gave the act of copying by hand a new dimension of cultural reverence. Those who considered themselves real scholars and true connoisseurs of the book did not consider imprints to be real books. Under the elitist attitudes of the time, "printed books were for those who did not truly care about books." However it should be noted that copyists and manuscript only continued to remain competitive with printed editions by dramatically reducing their price. According to the Ming dynasty author Hu Yinglin, "if no printed edition were available on the market, the hand-copied manuscript of a book would cost ten times as much as the printed work," also "once a printed edition appeared, the transcribed copy could no longer be sold and would be discarded." The result is that despite the mutual co-existence of hand-copied manuscripts and printed texts, the cost of the book had declined by about 90 percent by the end of the 16th century. As a result, literacy increased. In 1488, the Korean Choe Bu observed during his trip to China that "even village children, ferrymen, and sailors" could read, although this applied mainly to the south while northern China remained largely illiterate. Nine inscribed copper plates thought to belong to the mature Harappan phase (2600 - 1900 BCE), are thought to be used for printing. In Buddhism, great merit is thought to accrue from copying and preserving texts. The 4th-century[which?] master[who?] listed the copying of scripture as the first of ten essential religious practices. The importance of perpetuating texts is set out with special force in the longer Sukhāvatīvyūha Sūtra, which urges the devout not only to hear, learn, remember and study the text but to obtain a good copy and to preserve it. This "cult of the book" led to techniques for reproducing texts in great numbers, especially the short prayers or charms known as dhāraṇīs. Stamps were carved for printing these prayers on clay tablets from at least the 7th century, the date of the oldest surviving examples. Around the mid-century, block-books, woodcut books with both text and images, usually carved in the same block, emerged as a cheaper alternative to manuscripts and books printed with movable type. These were all short heavily illustrated works, the bestsellers of the day, repeated in many different block-book versions: the Ars moriendi and the Biblia pauperum were the most common. There is still some controversy among scholars as to whether their introduction preceded or, the majority view, followed the introduction of movable type, with the range of estimated dates being between about 1440–1460. Movable type is the system of printing and typography using movable pieces of metal type, made by casting from matrices struck by letterpunches. Movable-type was invented in the Northern Song dynasty around the year 1041 by the commoner Bi Sheng. Bi Sheng's movable-type was fired in porcelain. After his death, the ceramic movable-type passed onto his descendants. The next mention of movable-type occurred in 1193 when a Southern Song chief counselor, Zhou Bida (周必大), attributed the movable-type method of printing to Shen Kuo. However Shen Kuo did not invent the movable-type but credited it to Bi Sheng in his Dream Pool Essays. The ceramic movable-type was also mentioned by Kublai Khan's councilor Yao Shu, who convinced his pupil Yang Gu to print language primers using this method.. The ceramic type did not hold the watery Chinese ink well, and had the additional disadvantage of the size of the type sometimes changing during the baking process, resulting in uneven matching of the type, and preventing it from becoming popular. Bi Sheng also developed wooden movable type, but it was abandoned in favor of ceramic types due to the presence of wood grains and the unevenness of the wooden type after being soaked in ink. However wooden movable type had evidently reached the Tangut Western Xia to the west by the 12th century. There, the Tanguts printed the Auspicious Tantra of All-Reaching Union, a 449-page text considered to be the earliest extant example of a text printed using the wooden movable type. Wang Zhen, who lived in the Yuan dynasty, also described the wooden movable type in his Book of Agriculture (Nongshu 農書) of 1313. Now, however, there is another method [beyond earthenware type] that is both more exact and more convenient. A compositor's form is made of wood, strips of bamboo are used to mark the lines and a block is engraved with characters. The block is then cut into squares with a small fine saw till each character forms a separate piece. These separate characters are finished off with a knife on all four sides, and compared and tested till they are exactly the same height and size. Then the types are placed in the columns [of the form] and bamboo strips which have been prepared are pressed in between them. After the types have all been set in the form, the spaces are filled in with wooden plugs, so that the type is perfectly firm and will not move. When the type is absolutely firm, the ink is smeared on and printing begins. Wang Zhen used two rotating circular tables as trays for laying out his type. The first table was separated into 24 trays in which each movable type was categorized based on a number corresponding with a rhyming pattern. The second table contained miscellaneous characters. Using more than 30,000 wooden movable types, Wang Zhen printed a hundred copies of his county gazetteer, Records of Jingde County (Jingde xianzhi 旌德縣志), a text containing more than 60,000 characters. Wooden movable type printing became relatively common during the Ming dynasty and became widespread during the Qing era.. Type used to print the earliest extant book using movable type - the Jikji (1377). Models of Bi Sheng's revolving typecase tables. Metal movable type appeared in the late Song and Yuan. Bronze movable types were used to print banknotes and official documents by both the Song and Jin. In the Jin dynasty, copper-block prints were slotted with two square holes for embedding bronze movable type characters, each selected from 1000 different characters, such that each printed paper money had a different combination of markers. A copper block printed paper banknote dated between 1215–1216 in the collection of Luo Zhenyu's Pictorial Paper Money of the Four Dynasties, 1914, shows two special characters: one called Ziliao, the other called Zihao, for the purpose of preventing counterfeit. Over the Ziliao there is a small character (輶) printed with movable copper type, while over the Zihao there is an empty square hole; apparently the associated copper metal type was lost. Another sample of Song dynasty money of the same period in the collection of Shanghai Museum has two empty square holes above Ziliao as well as Zihou, due to the loss of two copper movable types. In 1234, cast metal movable type was used in Goryeo (Korea) to print the 50-volume Prescribed Texts for Rites of the Past and Present, but no copies survived to the present. The oldest extant book printed with movable metal type is the Jikji of 1377. This form of metal movable type was described by the French scholar Henri-Jean Martin as "extremely similar to Gutenberg's". Tin movable type is mentioned in Wang Zhen's Zao Huozi Yinshufa (造活字印書法) of 1298, but it was considered unsatisfactory due to incompatibility with the inking process.. Only in the late 15th century did bronze movable type begin to be widely used in China. Korean printing with movable metallic type developed mainly within the royal foundry of the Yi dynasty. Royalty kept a monopoly of this new technique and by royal mandate suppressed all non-official printing activities and any budding attempts at commercialization of printing. Thus, printing in early Korea served only the small, noble groups of the highly stratified society. Only during the Ming and Qing dynasties did wooden and metal movable types see any considerable use, but the preferred method remained woodblock. Usage of movable type in China never exceeded 10 percent of all printed materials while 90 percent of printed books used the older woodblock technology. In one case an entire set of wooden type numbering 250,000 pieces was used for firewood. Woodblocks remained the dominant printing method in China until the introduction of lithography in the late 19th century. In Japan the use of printing beyond its Buddhist origins was insignificant for centuries after its introduction. Printing of secular materials did not pick up until the late 16th century. The Setsuyō-shū, a two-volume Chinese-Japanese dictionary printed in 1591, was the first secular book to be printed in Japan. Only after Toyotomi Hideyoshi's invasions of Korea, which brought back artisans and printing equipment in 1593, did Japan acquire its own wooden type font. Under Emperor Go-Yōzei's orders, the Confucian Analects were printed using metal movable type in 1598. It is generally considered to be the earliest extant Japanese text printed using metal movable type. The popularity of movable type in Japan was short lived. By the 1640s woodblock printing had reasserted itself as the dominant mode of printing in Japan. Traditionally it has been assumed that the prevalence of woodblock printing in East Asia as a result of Chinese characters led to the stagnation of printing culture and enterprise in that region. S. H. Steinberg describes woodblock printing in his Five Hundred Years of Printing as having "outlived their usefulness" and their printed material as "cheap tracts for the half-literate, ... which anyway had to be very brief because of the laborious process of cutting the letters." John Man's The Gutenberg Revolution makes a similar case: "wood-blocks were even more demanding than manuscript pages to make, and they wore out and broke, and then you had to carve another one - a whole page at a time." Other modern scholars such as Endymion Wilkinson hold a more conservative and skeptical view. While Wilkinson does not deny "China's dominance in book production from the fourth to the fifteenth century," he also insists that arguments for the Chinese advantage "should not be extended either forwards or backwards in time." 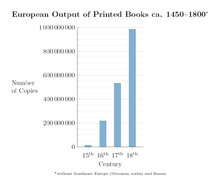 European book production began to catch up with China after the introduction of the mechanical printing press in the mid fifteenth century. Reliable figures of the number of imprints of each edition are as hard to find in Europe as they are in China, but one result of the spread of printing in Europe was that public and private libraries were able to build up their collections and for the first time in over a thousand years they began to match and then overtake the largest libraries in China. Eastern metal movable type may have spread to Europe between the late 14th and early 15th centuries.However, currently, there is an absence of direct evidence Western movable type printing was influenced by Asian printing: "No text indicates the presence or knowledge of any kind of Asian movable type or movable type imprint in Europe before 1450. The material evidence is even more conclusive." It is traditionally surmised that Johannes Gutenberg, of the German city of Mainz, developed European movable type printing technology with the printing press around 1439 and in just over a decade, the European age of printing began. However, the evidence shows a more complex evolutionary process, spread over multiple locations. Also, Johann Fust and Peter Schöffer experimented with Gutenberg in Mainz. Compared to woodblock printing, movable type page-setting was quicker and more durable. The metal type pieces were more durable and the lettering was more uniform, leading to typography and fonts. The high quality and relatively low price of the Gutenberg Bible (1455) established the superiority of movable type, and printing presses rapidly spread across Europe, leading up to the Renaissance, and later all around the world. Today, practically all movable type printing ultimately derives from Gutenberg's movable type printing, which is often regarded as the most important invention of the second millennium. Gutenberg is also credited with the introduction of an oil-based ink which was more durable than previously used water-based inks. Having worked as a professional goldsmith, Gutenberg made skillful use of his knowledge of metals. He was also the first to make his type from an alloy of lead, tin, and antimony, known as type metal, printer's lead, or printer's metal, which was critical for producing durable type that produced high-quality printed books, and proved to be more suitable for printing than the clay, wooden or bronze types used in East Asia. To create these lead types, Gutenberg used what some considered his most ingenious invention: a special matrix which enabled the moulding of new movable types with an unprecedented precision at short notice. Within a year of printing the Gutenberg Bible, Gutenberg also published the first coloured prints. The invention of the printing press revolutionized communication and book production, leading to the spread of knowledge. Printing was rapidly spread from Germany by emigrating German printers, but also by foreign apprentices returning home. A printing press was built in Venice in 1469, and by 1500 the city had 417 printers. In 1470 Johann Heynlin set up a printing press in Paris. In 1473 Kasper Straube published the Almanach cracoviense ad annum 1474 in Kraków. Dirk Martens set up a printing press in Aalst (Flanders) in 1473. He printed a book about the two lovers of Enea Piccolomini who became Pope Pius II. In 1476 a printing press was set up in England by William Caxton. The Italian Juan Pablos set up an imported press in Mexico City in 1539. The first printing press in Southeast Asia was set up in the Philippines by the Spanish in 1593. The Rev. Jose Glover intended to bring the first printing press to England's American colonies in 1638, but died on the voyage, so his widow, Elizabeth Harris Glover, established the printing house, which was run by Stephen Day and became The Cambridge Press. The Gutenberg press was much more efficient than manual copying. It remained largely unchanged in the eras of John Baskerville and Giambattista Bodoni, over 300 years later. By 1800, Lord Stanhope had constructed a press completely from cast iron, reducing the force required by 90% while doubling the size of the printed area. While Stanhope's "mechanical theory" had improved the efficiency of the press, it was only capable of 250 sheets per hour. German printer Friedrich Koenig was the first to design a non-manpowered machine—using steam. He moved to London in 1804, and met Thomas Bensley; he secured financial support for his project in 1807. With a patent in 1810, Koenig designed a steam press "much like a hand press connected to a steam engine." The first production trial of this model occurred in April 1811. Printing press from 1811, photographed in Munich, Germany. A printing press is a mechanical device for applying pressure to an inked surface resting upon a medium (such as paper or cloth), thereby transferring an image. The systems involved were first assembled in Germany by the goldsmith Johannes Gutenberg in the mid-15th century. Printing methods based on Gutenberg's printing press spread rapidly throughout first Europe and then the rest of the world, replacing most block printing and making it the sole progenitor of modern movable type printing. As a method of creating reproductions for mass consumption, the printing press has been superseded by the advent of offset printing. Johannes Gutenberg's work in the printing press began in approximately 1436 when he partnered with Andreas Dritzehen—a man he had previously instructed in gem-cutting—and Andreas Heilmann, owner of a paper mill. It was not until a 1439 lawsuit against Gutenberg that official record exists; witnesses testimony discussed type, an inventory of metals (including lead) and his type mold..
Others in Europe were developing movable type at this time, including goldsmith Procopius Waldfoghel of France and Laurens Janszoon Coster of the Netherlands. They are not known to have contributed specific advances to the printing press. While the Encyclopædia Britannica Eleventh Edition had attributed the invention of the printing press to Coster, the company now states that is incorrect. 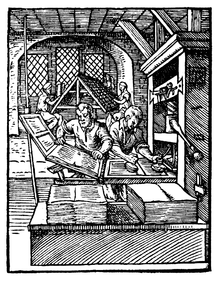 Early printing houses (near the time of Gutenberg) were run by "master printers." These printers owned shops, selected and edited manuscripts, determined the sizes of print runs, sold the works they produced, raised capital and organized distribution. Some master printing houses, like that of Aldus Manutius, became the cultural center for literati such as Erasmus. Print shop apprentices: Apprentices, usually between the ages of 15 and 20, worked for master printers. Apprentices were not required to be literate, and literacy rates at the time were very low, in comparison to today. Apprentices prepared ink, dampened sheets of paper, and assisted at the press. An apprentice who wished to learn to become a compositor had to learn Latin and spend time under the supervision of a journeyman. Journeyman printers: After completing their apprenticeships, journeyman printers were free to move employers. This facilitated the spread of printing to areas that were less print-centred. Compositors: Those who set the type for printing. Pressmen: the person who worked the press. This was physically labour-intensive. The earliest-known image of a European, Gutenberg-style print shop is the Dance of Death by Matthias Huss, at Lyon, 1499. This image depicts a compositor standing at a compositor's case being grabbed by a skeleton. The case is raised to facilitate his work. At the right of the printing house a bookshop is shown. According to court records from the city of Mainz, Johannes Fust was for some time Gutenberg's financial backer. By the 16th century jobs in printing were becoming increasingly specialized. Structures[clarification needed] supporting publishers were more and more complex, leading to division of labour. In Europe between 1500 and 1700 the role of the Master Printer was dying out and giving way to the bookseller—publisher. During this period, printing had a stronger commercial imperative than previously. Risks associated with the industry however were substantial, although dependent on the nature of the publication. Bookseller publishers negotiated at trade fairs and at print shops. Jobbing work appeared: some printers performed menial tasks at the beginning of their careers to support themselves. Cooperative associations/publication syndicates—a number of individuals shared the risks associated with printing and shared in the profit. This was pioneered by the French. Subscription publishing: pioneered by the English in the early 17th century. A prospectus for a publication was drawn up by a publisher to raise funding. The prospectus was given to potential buyers who signed up for a copy. If there were not enough subscriptions the publication did not go ahead. Lists of subscribers were included in the books as endorsements. If enough people subscribed, there might be a reprint. Some authors used subscription publication to bypass the publisher entirely. Installment publishing: books were issued in parts until a complete book had been issued. This was not necessarily done within a fixed time period. It was an effective method of spreading the cost over a period of time. It also allowed earlier returns on investment to help cover the production costs of subsequent installments. The Mechanick Exercises, by Joseph Moxon, in London, 1683, was said to be the first publication in installments. Publishing trade organizations allowed publishers to organize business concerns collectively. These arrangements included systems of self-regulation. For example, if one publisher did something to irritate other publishers he would be controlled by peer pressure. Such systems are known as cartels, and are in most countries now considered to be in restraint of trade. These arrangements helped deal with labour unrest among journeymen, who faced difficult working conditions. Brotherhoods predated unions, without the formal regulations now associated with unions. In most cases, publishers bought the copyright in a work from the author, and made some arrangement about the possible profits. This required a substantial amount of capital in addition to that needed for the physical equipment and staff. Alternatively, an author with some capital available would sometimes keep the copyright himself, and simply pay the printer to print the book. In a rotary printing press, the impressions are carved around a cylinder so that the printing can be done on long continuous rolls of paper, cardboard, plastic, or a large number of other substrates. Rotary drum printing was invented by Richard March Hoe in 1843 and patented in 1847, and then significantly improved by William Bullock in 1863. Intaglio (/ɪnˈtælioʊ/) is a family of printmaking techniques in which the image is incised into a surface, known as the matrix or plate. Normally, copper or zinc plates are used as a surface, and the incisions are created by etching, engraving, drypoint, aquatint or mezzotint. Collographs may also be printed as intaglio plates. To print an intaglio plate the surface is covered in thick ink and then rubbed with tarlatan cloth to remove most of the excess. The final smooth wipe is usually done by hand, sometimes with the aid of newspaper or old public phone book pages, leaving ink only in the incisions. A damp piece of paper is placed on top and the plate and paper are run through a printing press that, through pressure, transfers the ink from the recesses of the plate to the paper. Lithography press for printing maps in Munich. 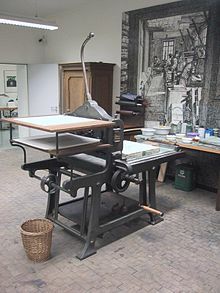 Invented by Bavarian author Aloys Senefelder in 1796, lithography is a method for printing on a smooth surface. Lithography is a printing process that uses chemical processes to create an image. For instance, the positive part of an image would be a hydrophobic chemical, while the negative image would be water. Thus, when the plate is introduced to a compatible ink and water mixture, the ink will adhere to the positive image and the water will clean the negative image. This allows for a relatively flat print plate which allows for much longer runs than the older physical methods of imaging (e.g., embossing or engraving). High-volume lithography is used today to produce posters, maps, books, newspapers, and packaging — just about any smooth, mass-produced item with print and graphics on it. Most books, indeed all types of high-volume text, are now printed using offset lithography. In offset lithography, which depends on photographic processes, flexible aluminum, polyester, mylar or paper printing plates are used in place of stone tablets. Modern printing plates have a brushed or roughened texture and are covered with a photosensitive emulsion. A photographic negative of the desired image is placed in contact with the emulsion and the plate is exposed to ultraviolet light. After development, the emulsion shows a reverse of the negative image, which is thus a duplicate of the original (positive) image. The image on the plate emulsion can also be created through direct laser imaging in a CTP (Computer-To-Plate) device called a platesetter. The positive image is the emulsion that remains after imaging. For many years, chemicals have been used to remove the non-image emulsion, but now plates are available that do not require chemical processing. Calvert Lithographic Company, Detroit, MI. Uncle Sam Supplying the World with Berry Brothers Hard Oil Finish, c. 1880. Noel Wisdom Chromolithograph Collection, Special Collections Department, The University of South Florida Tampa Library. According to Michael Sullivan, the earliest known example of color printing "is a two-color frontispiece to a Buddhist sutra scroll, dated 1346". Color printing continued to be used in China throughout the Ming and Qing Dynasty. Chromolithography became the most successful of several methods of colour printing developed by the 19th century; other methods were developed by printers such as Jacob Christoph Le Blon, George Baxter and Edmund Evans, and mostly relied on using several woodblocks with the colors. Hand-coloring also remained important; elements of the official British Ordnance Survey maps were colored by hand by boys until 1875. Chromolithography developed from lithography and the term covers various types of lithography that are printed in color. The initial technique involved the use of multiple lithographic stones, one for each color, and was still extremely expensive when done for the best quality results. Depending on the number of colors present, a chromolithograph could take months to produce, by very skilled workers. However much cheaper prints could be produced by simplifying both the number of colors used, and the refinement of the detail in the image. Cheaper images, like the advertisement illustrated, relied heavily on an initial black print (not always a lithograph), on which colors were then overprinted. To make an expensive reproduction print as what was once referred to as a "’chromo’", a lithographer, with a finished painting in front of him, gradually created and corrected the many stones using proofs to look as much as possible like the painting in front of him, sometimes using dozens of layers. Aloys Senefelder, the inventor of lithography, introduced the subject of colored lithography in his 1818 Vollstaendiges Lehrbuch der Steindruckerey (A Complete Course of Lithography), where he told of his plans to print using color and explained the colors he wished to be able to print someday. Although Senefelder recorded plans for chromolithography, printers in other countries, such as France and England, were also trying to find a new way to print in color. Godefroy Engelmann of Mulhouse in France was awarded a patent on chromolithography in July 1837, but there are disputes over whether chromolithography was already in use before this date, as some sources say, pointing to areas of printing such as the production of playing cards. Flexography (also called "surface printing"), often abbreviated to "flexo", is a method of printing most commonly used for packaging (labels, tape, bags, boxes, banners, and so on). A flexo print is achieved by creating a mirrored master of the required image as a 3D relief in a rubber or polymer material. A measured amount of ink is deposited upon the surface of the printing plate (or printing cylinder) using an anilox roll. The print surface then rotates, contacting the print material which transfers the ink. Originally flexo printing was basic in quality. Labels requiring high quality have generally been printed Offset until recently. In the last few years great advances have been made to the quality of flexo printing presses. The greatest advances though have been in the area of PhotoPolymer Printing Plates, including improvements to the plate material and the method of plate creation. —usually photographic exposure followed by chemical etch, though also by direct laser engraving. A dot matrix printer or impact matrix printer refers to a type of computer printer with a print head that runs back and forth on the page and prints by impact, striking an ink-soaked cloth ribbon against the paper, much like a typewriter. Unlike a typewriter or daisy wheel printer, letters are drawn out of a dot matrix, and thus, varied fonts and arbitrary graphics can be produced. Because the printing involves mechanical pressure, these printers can create carbon copies and carbonless copies. Each dot is produced by a tiny metal rod, also called a "wire" or "pin", which is driven forward by the power of a tiny electromagnet or solenoid, either directly or through small levers (pawls). Facing the ribbon and the paper is a small guide plate (often made of an artificial jewel such as sapphire or ruby ) pierced with holes to serve as guides for the pins. The moving portion of the printer is called the print head, and when running the printer as a generic text device generally prints one line of text at a time. Most dot matrix printers have a single vertical line of dot-making equipment on their print heads; others have a few interleaved rows in order to improve dot density. The first dot-matrix printers were invented in Japan. In 1968, Japanese manufacturer Epson released the EP-101, the world's first dot-matrix printer. The same year, Japanese manufacturer OKI introduced the first serial impact dot matrix printer (SIDM), the OKI Wiredot. A thermal printer (or direct thermal printer) produces a printed image by selectively heating coated thermochromic paper, or thermal paper as it is commonly known, when the paper passes over the thermal print head. The coating turns black in the areas where it is heated, producing an image. The laser printer, based on a modified xerographic copier, was invented at Xerox in 1969 by researcher Gary Starkweather, who had a fully functional networked printer system working by 1971. Laser printing eventually became a multibillion-dollar business for Xerox. The first commercial implementation of a laser printer was the IBM model 3800 in 1976, used for high-volume printing of documents such as invoices and mailing labels. It is often cited as "taking up a whole room," implying that it was a primitive version of the later familiar device used with a personal computer. While large, it was designed for an entirely different purpose. Many 3800s are still in use. The first laser printer designed for use with an individual computer was released with the Xerox Star 8010 in 1981. Although it was innovative, the Star was an expensive ($17,000) system that was only purchased by a small number of laboratories and institutions. After personal computers became more widespread, the first laser printer intended for a mass market was the HP LaserJet 8ppm, released in 1984, using a Canon engine controlled by HP software. The HP LaserJet printer was quickly followed by other laser printers from Brother Industries, IBM, and others. Most noteworthy was the role the laser printer played in popularizing desktop publishing with the introduction of the Apple LaserWriter for the Apple Macintosh, along with Aldus PageMaker software, in 1985. With these products, users could create documents that would previously have required professional typesetting. Inkjet printers are a type of computer printer that operates by propelling tiny droplets of liquid ink onto paper. A dye-sublimation printer (or dye-sub printer) is a computer printer which employs a printing process that uses heat to transfer dye to a medium such as a plastic card, printer paper or poster paper. The process is usually to lay one color at a time using a ribbon that has color panels. Most dye-sublimation printers use CMYO colors which differs from the more recognised CMYK colors in that the black dye is eliminated in favour of a clear overcoating. This overcoating (which has numerous names depending on the manufacturer) is effectively a thin laminate which protects the print from discoloration from UV light and the air while also rendering the print water-resistant. Many consumer and professional dye-sublimation printers are designed and used for producing photographic prints. Digital printing is the reproduction of digital images on a physical surface, such as common or photographic paper or paperboard-cover stock, film, cloth, plastic, vinyl, magnets, labels etc. Every impression made onto the paper can be different, as opposed to making several hundred or thousand impressions of the same image from one set of printing plates, as in traditional methods. The Ink or Toner does not absorb into the substrate, as does conventional ink, but forms a layer on the surface and may be fused to the substrate by using an inline fuser fluid with heat process (toner) or UV curing process (ink). It generally requires less waste in terms of chemicals used and paper wasted in set up or makeready (bringing the image "up to color" and checking position). It is excellent for rapid prototyping, or small print runs which means that it is more accessible to a wider range of designers and more cost effective in short runs. Screenshot of a CAM program for designing frescographies. Frescography is a method for reproduction/creation of murals using digital printing methods, invented in 1998 by Rainer Maria Latzke, and patented in 2000. The frescography is based on digitally cut-out motifs which are stored in a database. CAM software programs then allow to enter the measurements of a wall or ceiling to create a mural design with low resolution motifs. Since architectural elements such as beams, windows or doors can be integrated, the design will result in an accurately and tailor-fit wall mural. Once a design is finished, the low resolution motifs are converted into the original high resolution images and are printed on canvas by Wide-format printers. The canvas then can be applied to the wall in a wall-paperhanging like procedure and will then look like on-site created mural. Three-dimensional printing is a method of converting a virtual 3D model into a physical object. 3D printing is a category of rapid prototyping technology. 3D printers typically work by 'printing' successive layers on top of the previous to build up a three dimensional object. 3D printers are generally faster, more affordable and easier to use than other additive fabrication technologies. Woodcut is a relief printing artistic technique in printmaking in which an image is carved into the surface of a block of wood, with the printing parts remaining level with the surface while the non-printing parts are removed, typically with gouges. The areas to show 'white' are cut away with a knife or chisel, leaving the characters or image to show in 'black' at the original surface level. The block is cut along the grain of the wood (unlike wood engraving where the block is cut in the end-grain). In Europe beechwood was most commonly used; in Japan, a special type of cherry wood was popular. Woodcut first appeared in ancient China. From 6th century onward, woodcut icons became popular and especially flourished in Chinese Buddhism. Since the 10th century, woodcut pictures appeared as illustrations in Chinese books, on banknotes such as Jiaozi (currency), and as single sheet images. Woodcut New Year pictures are also very popular with the Chinese. In China and Tibet printed images mostly remained tied as illustrations to accompanying text until the modern period. The earliest woodblock printed book, the Diamond Sutra contains a large image as frontispiece, and many Buddhist texts contain some images. Later some notable Chinese artists designed woodcuts for books, the individual print develop in China in the form of New Year picture as an art-form in the way it did in Europe and Japan. In Europe, woodcut is the oldest technique used for old master prints, developing about 1400, by using on paper existing techniques for printing on cloth. The explosion of sales of cheap woodcuts in the middle of the century led to a fall in standards, and many popular prints were very crude. The development of hatching followed on rather later than in engraving. Michael Wolgemut was significant in making German woodcut more sophisticated from about 1475, and Erhard Reuwich was the first to use cross-hatching (far harder to do than in engraving or etching). Both of these produced mainly book-illustrations, as did various Italian artists who were also raising standards there at the same period. At the end of the century Albrecht Dürer brought the Western woodcut to a level that has never been surpassed, and greatly increased the status of the single-leaf (i.e. an image sold separately) woodcut. Engraving is the practice of incising a design onto a hard, flat surface, by cutting grooves into it. The result may be a decorated object in itself, as when silver, gold or steel are engraved, or may provide an intaglio printing plate, of copper or another metal, for printing images on paper, which are called engravings. Engraving was a historically important method of producing images on paper, both in artistic printmaking, and also for commercial reproductions and illustrations for books and magazines. It has long been replaced by photography in its commercial applications and, partly because of the difficulty of learning the technique, is much less common in printmaking, where it has been largely replaced by etching and other techniques. Other terms often used for engravings are copper-plate engraving and Line engraving. These should all mean exactly the same, but especially in the past were often used very loosely to cover several printmaking techniques, so that many so-called engravings were in fact produced by totally different techniques, such as etching. In antiquity, the only engraving that could be carried out is evident in the shallow grooves found in some jewellery after the beginning of the 1st Millennium B.C. The majority of so-called engraved designs on ancient gold rings or other items were produced by chasing or sometimes a combination of lost-wax casting and chasing. In the European Middle Ages goldsmiths used engraving to decorate and inscribe metalwork. It is thought that they began to print impressions of their designs to record them. From this grew the engraving of copper printing plates to produce artistic images on paper, known as old master prints in Germany in the 1430s. Italy soon followed. Many early engravers came from a goldsmithing background. The first and greatest period of the engraving was from about 1470 to 1530, with such masters as Martin Schongauer, Albrecht Dürer, and Lucas van Leiden. Etching is the process of using strong acid or mordant to cut into the unprotected parts of a metal surface to create a design in intaglio in the metal (the original process—in modern manufacturing other chemicals may be used on other types of material). As an intaglio method of printmaking it is, along with engraving, the most important technique for old master prints, and remains widely used today. Halftone is the reprographic technique that simulates ones it is continuous tone imagery through the use of equally spaced dots of varying size. 'Halftone' can also be used to refer specifically to the image that is produced by this process. The idea of halftone printing originates from William Fox Talbot. In the early 1850s he suggested using "photographic screens or veils" in connection with a photographic intaglio process. Several different kinds of screens were proposed during the following decades, but the first half-tone photo-engraving process was invented by Canadians George-Édouard Desbarats and William Leggo Jr. On October 30, 1869, Desbarats published the Canadian Illustrated News which became the world's first periodical to successfully employ this photo-mechanical technique; featuring a full page half-tone image of His Royal Highness Prince Arthur, from a photograph by Notman. Ambitious to exploit a much larger circulation, Debarats and Leggo went to New York and launched the New York Daily Graphic in March 1873, which became the world's first illustrated daily. The first truly successful commercial method was patented by Frederic Ives of Philadelphia in 1881. But although he found a way of breaking up the image into dots of varying sizes he did not make use of a screen. In 1882 the German George Meisenbach patented a halftone process in England. His invention was based on the previous ideas of Berchtold and Swan. He used single lined screens which were turned during exposure to produce cross-lined effects. He was the first to achieve any commercial success with relief halftones. Xerography (or electrophotography) is a photocopying technique developed by Chester Carlson in 1938 and patented on October 6, 1942. He received U.S. Patent 2,297,691 for his invention. The name xerography came from the Greek radicals xeros (dry) and graphos (writing), because there are no liquid chemicals involved in the process, unlike earlier reproduction techniques like cyanotype. In 1938 Bulgarian physicist Georgi Nadjakov found that when placed into electric field and exposed to light, some dielectrics acquire permanent electric polarization in the exposed areas. That polarization persists in the dark and is destroyed in light. Chester Carlson, the inventor of photocopying, was originally a patent attorney and part-time researcher and inventor. His job at the patent office in New York City required him to make a large number of copies of important papers. Carlson, who was arthritic, found this a painful and tedious process. This prompted him to conduct experiments with photoconductivity. Carlson experimented with "electrophotography" in his kitchen and in 1938, applied for a patent for the process. He made the first "photocopy" using a zinc plate covered with sulfur. The words "10-22-38 Astoria" were written on a microscope slide, which was placed on top of more sulfur and under a bright light. After the slide was removed, a mirror image of the words remained. Carlson tried to sell his invention to some companies, but because the process was still underdeveloped he failed. At the time multiple copies were made using carbon paper or duplicating machines and people did not feel the need for an electronic machine. Between 1939 and 1944, Carlson was turned down by over 20 companies, including IBM and GE, neither of which believed there was a significant market for copiers. ^ Ghosh, Pallab. 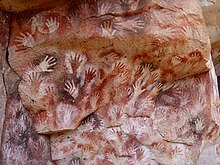 "Cave paintings change ideas about the origin of art". BBC News. BBC News. "The minimum age for (the outline of the hand) is 39,900 years old, which makes it the oldest hand stencil in the world," said Dr Aubert. "Next to it is , and this is one of the oldest figurative depictions in the world, if not the oldest one," he told BBC News. There are also paintings in the caves that are around 27,000 years old, which means that the inhabitants were painting for at least 13,000 years." ^ a b c Wilkinson 2012, p. 909. ^ a b c d e f g h i j k Wilkinson 2012, p. 910. ^ "History of Printing Timeline". American Printing History Association: To Encourage the Study of Printing History. Retrieved 22 December 2015. ^ Barrett 2008, p. 60. ^ Barrett 2008, p. 50. ^ Barrett 2008, p. 61. ^ Pan, Jixing (1997). "On the Origin of Printing in the Light of New Archaeological Discoveries". Chinese Science Bulletin. 42 (12): 976–981 [pp. 979–980]. doi:10.1007/BF02882611. ISSN 1001-6538. ^ http://www.bl.uk/onlinegallery/hightours/diamsutra/index.html The Xiantong era (咸通 Xián tōng) ran from 860-74, crossing the reigns of Yi Zong (懿宗 Yì zōng) and Xi Zong (僖宗 Xī zōng), see List of Tang Emperors. The book was thus prepared in the time of Yi Zong. ^ "Printing woodblocks of the Tripitaka Koreana and miscellaneous Buddhist scriptures". UNESCO Memory of the World. United Nations. Retrieved 30 July 2016. ^ a b Wilkinson 2012, p. 930. ^ Chia 2011, p. 43. ^ Chia 2011, p. 21. ^ Chia 2011, p. 33. ^ Chia 2011, p. 38. ^ a b Wilkinson 2012, p. 912. ^ Wilkinson 2012, p. 910-911. ^ Chia 2011, p. 41. ^ a b c Tsien 1985, p. 373. ^ Twitchett 1998b, p. 636. ^ Zwalf, Buddhism: Art and Faith (London: British Museum, 1985). ^ a b c d e f Wilkinson 2012, p. 911. ^ Tsien 1985, p. 221. ^ Tsien, Tsuen-Hsuin (1985). Paper and Printing. Needham, Joseph Science and Civilization in China:. vol. 5 part 1. Cambridge University Press. pp. 201–217. ISBN 0-521-08690-6. ^ Hou Jianmei (侯健美); Tong Shuquan (童曙泉) (20 December 2004). "《大夏寻踪》今展国博" ['In the Footsteps of the Great Xia' now exhibiting at the National Museum]. Beijing Daily (《北京日报》). ^ Needham, Volume 5, Part 1, 206-207. ^ Pan Jixing, A history of movable metal type printing technique in China 2001, pp. 41-54. ^ A History of Moveable Type Printing in China, by Pan Jixing, Professor of the Institute for History of Science, Academy of Science, Beijing, China, English Abstract, p. 273. ^ Taylor, Insup; Taylor, Martin M. (1995). Writing and Literacy in Chinese, Korean and Japanese. John Benjamins Publishing. p. 266. ISBN 9789027285768. Retrieved 12 January 2019. ^ Needham, Joseph; Tsien, Tsuen-Hsuin (11 July 1985). Science and Civilisation in China. 5. Cambridge University Press. p. 330. ^ Tsien 1985, p. 211. ^ Sohn, Pow-Key, "Early Korean Printing," Journal of the American Oriental Society, Vol. 79, No. 2 (April -June , 1959), pp. 96-103 (103). ^ Sansom, George (1961). "A History of Japan: 1334-1615." Stanford, California: Stanford University Press. ^ a b Barrett 2008, p. 10. ^ a b Barrett 2008, p. 11. ^ Twitchett 1998b, p. 637. ^ a b Wilkinson 2012, p. 935. ^ Polenz, Peter von. (1991). Deutsche Sprachgeschichte vom Spätmittelalter bis zur Gegenwart: I. Einführung, Grundbegriffe, Deutsch in der frühbürgerlichen Zeit (in German). New York/Berlin: Gruyter, Walter de GmbH. ^ Juan González de Mendoza (1585). Historia de las cosas más notables, ritos y costumbres del gran reyno de la China (in Spanish). ^ L. S. Stavrianos (1998) . A Global History: From Prehistory to the 21st Century (7th ed.). Upper Saddle River, New Jersey: Prentice Hall. ISBN 978-0-13-923897-0. ^ McDermott, Joseph P., ed. (2015). The Book Worlds of East Asia and Europe, 1450–1850: Connections and Comparisons. Hong Kong University Press. pp. 25–26. ISBN 978-988-8208-08-1. ^ In 1997, Time Life magazine picked Gutenberg's invention to be the most important of the second millennium. In 1999, the A&E Network voted Johannes Gutenberg "Man of the Millennium". See also 1,000 Years, 1,000 People: Ranking The Men and Women Who Shaped The Millennium Archived 2007-10-12 at the Wayback Machine which was composed by four prominent US journalists in 1998. ^ Typography - Gutenberg and printing in Germany. Encyclopædia Britannica ©2007. ^ Wiles, R. M. (2012). Serial Publication in England Before 1750. Cambridge University Press. p. 79. ^ "Planographic Printing". The New York Public Library. 1999-10-23. Retrieved 2014-11-21. ^ Clapper, Michael. "'I Was Once a Barefoot Boy! ': Cultural Tensions in a Popular Chromo." American Art 16(2002): 16-39. ^ a b c Ferry, Kathryn. "Printing the Alhambra: Owen Jones and Chromolithography." Architectural History 46(2003): 175–188. ^ "Information Processing Technology Heritage - Wiredot printer". Information Processing Society of Japan (IPSJ). 2012. Archived from the original on 2016-10-31. Retrieved 2016-10-31. ^ "OKI's Wiredot Printer Receives Information Processing Technology Heritage Certification in Japan". Mount Laurel, New Jersey, USA. 2013-03-14. Retrieved 2016-10-31. ^ "OKI Printer aus 1968 als technologisch wertvolles Erbe ausgezeichnet" (in German). 2013-03-26. Archived from the original on 2016-10-31. Retrieved 2016-10-31. ^ Edwin D. Reilly (2003). Milestones in Computer Science and Information Technology. Greenwood Press. ISBN 1-57356-521-0. ^ Roy A. Allan (2001). A History of the Personal Computer: The People and the Technology. Allan Publishing. ISBN 0-9689108-0-7. ^ "Close-Up On Technology - 3D Printers Lead Growth of Rapid Prototyping - 08/04". Archived from the original on 2010-01-23. Retrieved 2007-09-24. ^ a b Campbell, Alastair. The Designer's Lexicon. ©2000 Chronicle, San Francisco. ^ a b c Twyman, Michael. Eyre & Spottiswoode, London 1970. ^ Galarneau, Claude (1990). "Desbarats, George-Édouard-Amable". In Halpenny, Francess G (ed.). Dictionary of Canadian Biography. XII (1891–1900) (online ed.). University of Toronto Press.